The NZ mountainbike champ series/circus came to Wellington the other day. The green-belt based Course in Mount Victoria was used in the 1997 World Cup circuit when MTBing was at its heady heights, and had the distinction of being called the best urban-based course ever made. One of the organisers, Arthur Klapp, went on to spear-head organisation of the 2006 World MTB champs that were held in Rotorua with great success. I coach a couple of young athletes for Mountainbiking, and one of them was in with a chance of the overall series title. In New Zealand you have the national series - best 4 races from 6 starts (a massive undertaking), and the National Champs, a one-off race. Jordan Blake had won the first round of the nats at Coronet peak, but had had some dramas with poor gear selection, and breakages in other rounds, meaning his next best 2 results were 4ths. With a different kid winning the race in each town (always the local rider) Jord had a chance to get some good points in the final on his local track. Series leader (Tauranga's Ash Hough) only had to finish in the top three and the series was his ! It was pretty tense and Jord attacked like there was no tomorrow. He started so hard I was worried he was going to blow, but he did it well. 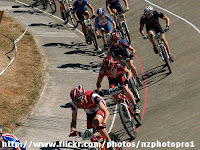 Poor Ash Hough got taken out within seconds of the start as the riders jockeyed for position on the lap they did of the Haitaitai Velodrome. Ash and another couple of guys went down real hard. They seemed to take ages getting going again and Ash fought his way back and had a gusty race to finish 4th..... 1 place off winning the national under 19 cross country championships. The title was Jordans! A 16 year old racing in the under 19 class. The other riders I coach had pretty good rides too, but Kane wasnt happy with his performance and straight away started training for the national secondary school MTB champs to be held in mid April. Kathryn enjoyed the brutally steep Mt Vic climbs and rode parts even the elite women were walking. I raced in the masters 2 class but was well and truly beaten into 4th place by original Karapoti Classic event organiser Simon Kennett, National series winner Trevor Woodward and another local, Ant Bradshaw. 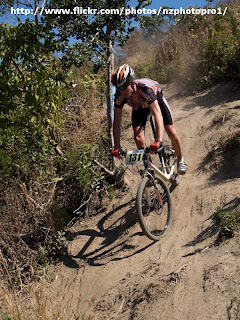 Santa Cruz Rep and NZ selector Mike Stylianou finished 5th, and 2nd overall in the masters 2 series. Series Results. "Stylie" coaches some real good up and coming young athletes including Nelsonian Gordon Bennett. Stylie was NZ Coach for the team that went to the Oceania MTB champs in Thredbo Australia a few weeks later. It wasnt the spectacle that the NZ Oceania champs were in Rotorua last year, and the weather turned bad for under 19 guys, but they got a taste of the level expected if they are to go head to head with the Aussies. Australias geographic size seems to be the biggest limiter in getting big fields of participants to these events. The standard is always very high though. Jordan came away with 6th place, and 2nd kiwi to Connor McFarlane whose technical riding skills were head and shoulders above the rest.